St Lucia's stunning verdant landscape and range of sites means it has a number of great excursions that you do as a part of your holiday. You secure your place on any of these excursions when you book your holiday with us and they can really offer you something different from this amazing Caribbean island. This full day cruise takes you from the north of St Lucia to the stunning southern shores where you’ll get to see the island’s natural beauty up close. 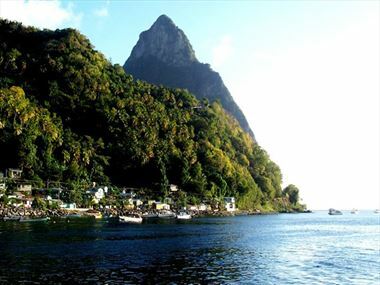 You’ll sail down past the Pitons – the two enormous peaks towering over the landscape. You’ll then dock at the dock of St Lucia’s former capital, Soufriere. Here you’ll visit the Sulphur Springs, see the Botanical Gardens and round it off with a refreshing dip in a natural waterfall pool. This is truly one of the ultimate St Lucia cruise excursions as it takes you to see the islands iconic beauty spots during a relaxed and restful day of sailing. 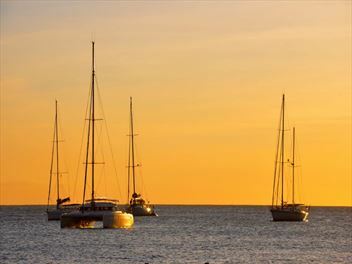 Prepare yourself for one of the most incredible sights of your holiday – the achingly beautiful St Lucian sunset. The cruise takes you out for two hours in an 18th century replica of a square top sail rigged schooner on the Caribbean Sea as the light slowly fades. Enjoy hors d’oeuvres and a variety of drinks while enjoying the gentle sounds of a live steel band on board the bat. Then when the moment comes, look for the stunning green flash as the sun sets to the West. This St Lucia sunset cruise is a wonderful experience that you’ll never forget in one of the world’s most remarkable locations. This is an amazing opportunity to go dolphin and whale watching in the Caribbean. The seas around St Lucia are home to a teeming variety of these captivating creatures including the spinning and spotted dolphin, the pilot and sperm whale – and who could forget the legendary Orca? The success rate of sightings is very high – but it cannot be guaranteed. Seeing the fins navigating the seas or getting the chance to watch them breach above the surface of the water is truly exhilarating. 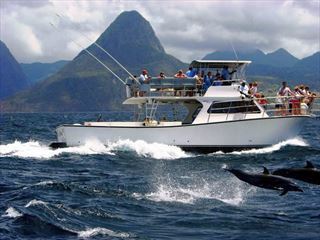 So if you would love to go whale watching, St Lucia could be the perfect place. With the chance to see the very best of St Lucia from the land and the sea, this tour is undoubtedly one of the most popular. Travelling down the west coast road to Soufriere, you’ll pass through small villages and pretty countryside in an air-conditioned bus. Here you’ll visit the Sulphur Springs and take a dip in a waterfall pool. You’ll then enjoy an option tour of an 18th century working estate before a lovely buffet lunch. Then you’ll drive down to the dock for the return journey by boat. Enjoy snorkelling or a relaxed swim in the sea and then cruise north. 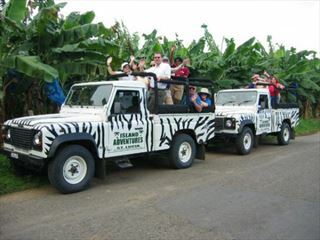 If you’d prefer to take a more adventurous experience on the land portion of the journey, this tour can also be booked in an open-topped Land Rover. 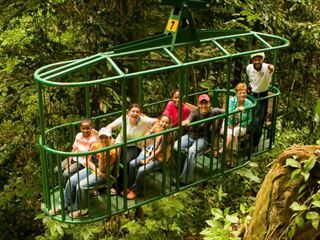 This is your chance to experience some of the most beautiful views on an aerial rainforest tram ride. You’ll see chirpy hummingbirds and other fabulous wildlife as well as enjoying truly spectacular panoramic vistas. Ascend silently through the trees and get the chance to see the gorgeous natural environment up close from an open-air gondola. An experienced guide will point out the forest’s vegetation and birdlife. This adventurous tour offers hours of fun and spectacular sights. After a short training session to prepare you for the day’s activities you’ll enjoy an open-air gondola ride into the St Lucian rainforest. 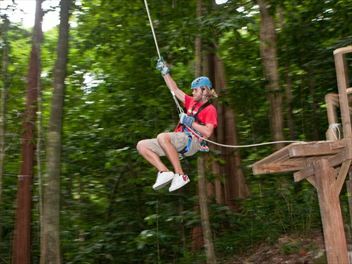 At the top you’ll hike to a zipline platform where you’ll experience the thrill of gliding through the verdant trees. The views are truly amazing and it is a very different experience of St Lucia that you’ll never forget. 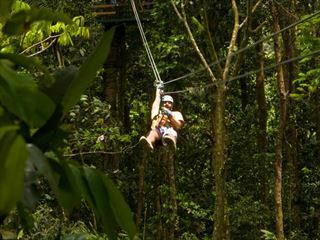 For fun and adventure all wrapped into one, look no further than this adrenaline-pumping zipline experience high in the St Lucian rainforest. With no age restriction, this is a perfect activity if you’re bringing the kids along – but we can promise that adults will love it just as much as children do. Soar high above the ground and enjoy the fun-loving thrills and stunning views of this incredible zipline adventure. 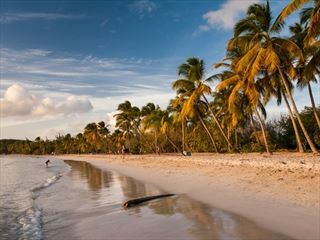 Looking to experience another Caribbean during your holiday? The island of Martinique might be the perfect option. It’s only 90 minutes away by boat and it boasts a beautiful landscape and an unexpected French culture. You’ll cruise over to the capital city, Fort de France where you’ll spend a couple of hours enjoying some shopping or taking a walking tour of the historical old town. Return to the boat for a tasty Caribbean barbeque and then enjoy a little time snorkelling or swimming before heading back to St Lucia. Dolphins often swim alongside the boat as you leave, escorting the boat out of the bay – the perfect end to the perfect day.